Confusion Magazine online is starting a new photographer spotlight series called Behind the Lens which spotlights the characters that document skateboarding to fill the pages of skateboarding magazines and websites around the world. 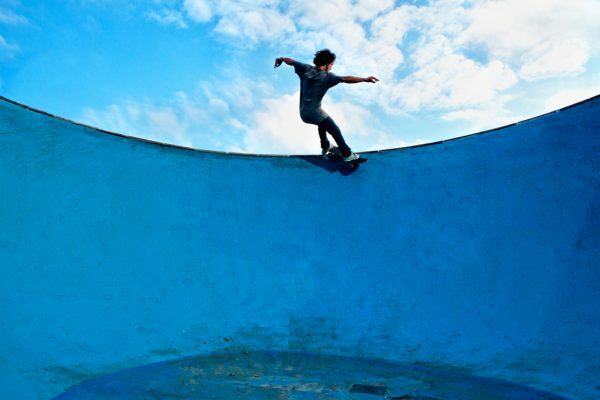 Without skate photographers, we would only have our faded memories of a session, from our own personal perspective, and would never see different diy spots, skateparks, ramps, ditches, backyard pools and street scenes around the world. 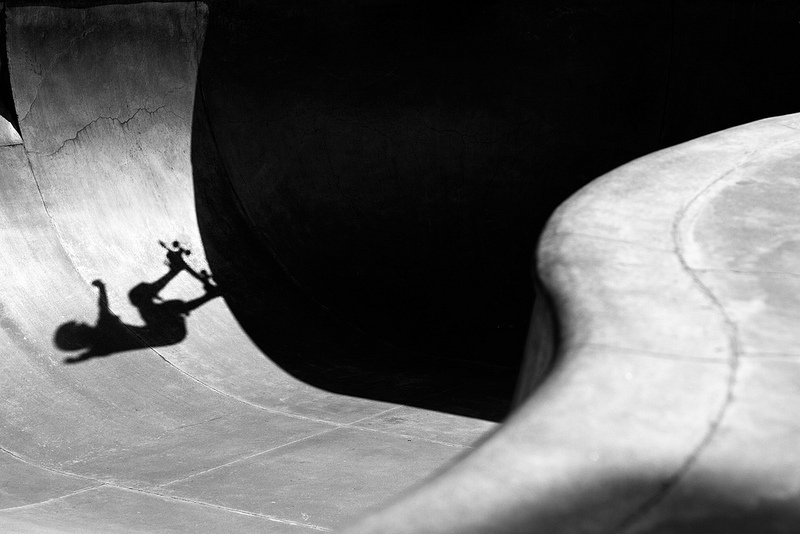 The skateboarder is the hero, but the personality behind the lens is the one that brings this duo together to successfully capture an instant in time and place. Whether exposing light onto film or onto megapixel memory sticks, each photographer has their own style, lighting techniques, lenses, angles and skaters they shoot with. They say a picture is worth a thousand words, so check out the photography of Ricardo Muñoz Carter, and if you have time you can find out which photographers inspire him, what equipment he uses, and how he started to shoot skate photos in the first place. Javier Mendizabal. 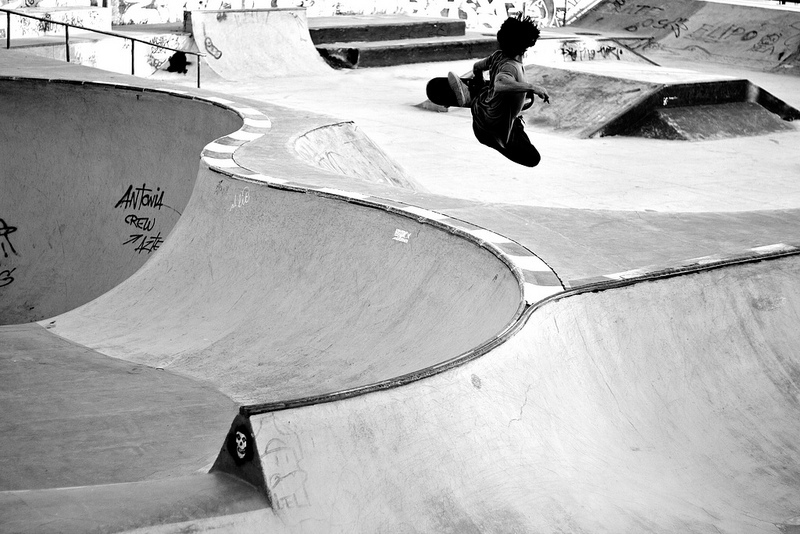 Bs Tailslide. Ripollet, Spain. Name, age, where are you from, and where do you live? 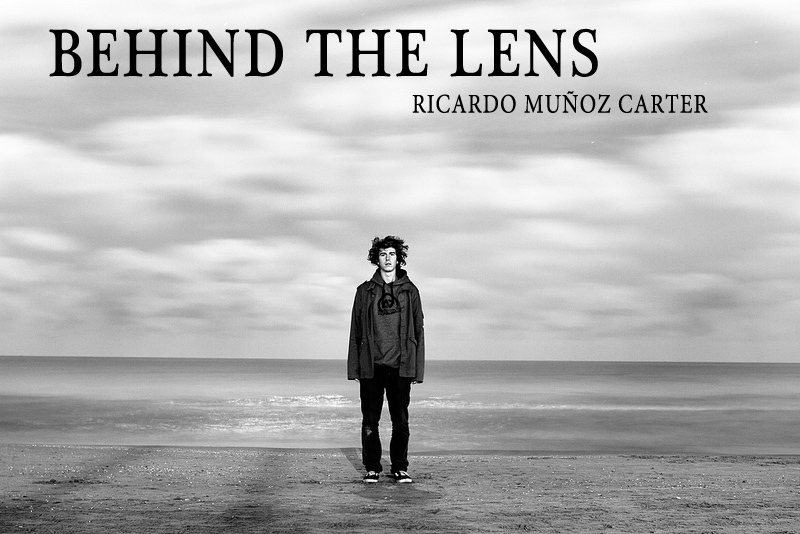 Hi my name is Ricardo Muñoz Carter, I’m 21 years old and I’m from Sitges, a small town 40 minutes out from Barcelona. I’ve grown up here and still live here, hopefully that will change in the next year. Nanaqui Costa. Backside Hurricane. Terrassa, Spain. How many years shooting photos and how many shooting Skate photos? I was given my first digital camera for my birthday when I was 15 , at that time I wasn’t much into photography and I just took it with me on surf trips and snapped one or two photos to remember the good times. When I was 17 I bought a DSLR and started getting really into it, learning all the basics and trying to take photos consciously, but I didn’t start shooting skateboarding on a regular basis until two years ago. Yeray Escobar. 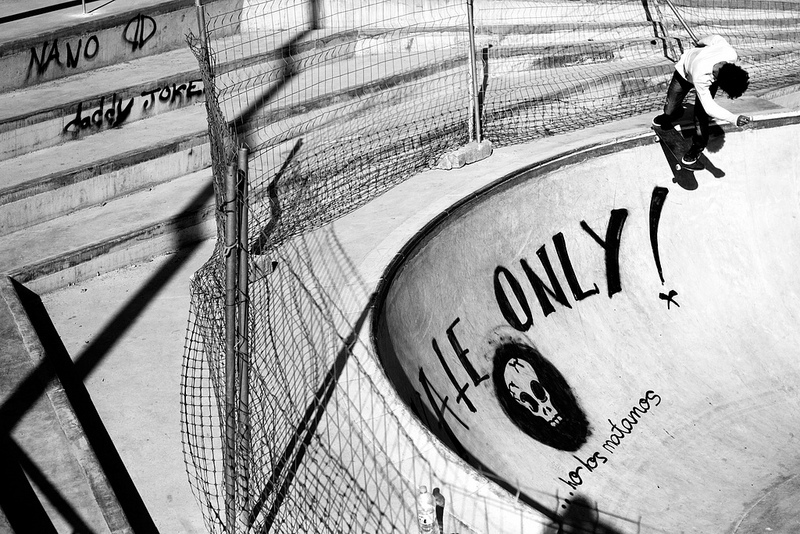 Frontside Rock. Gulliver, Spain. At the moment I’m working with a Canon 7D, 35mm, 50mm, 15-85mm and just recently bought a fisheye, I never had one before. I also have two flashes and triggers in my backpack. When we got to Tarragona we heeded directly to the port where we knew this famous spot from Tom Penny’s firing line, we were greeted with banks, ledges and blazing sun! Nico Cook. BS Ollie. What’s your secrete f-stop and shutter speed with and without a flash? There really isn’t any secret f-stop, it depends so much on the light and subject I’m working with, I usually like to work with a small f-stop for shallow depth of field, but it really depends on the situation and what you want to show. The same happens with flash. It depends so much on the situation and having to work around with the light and what you want to show. Nahuel Ortega. FS 360 Tucknee. Premia, Spain. Which of your friends do you like to shoot the most? I’m really stoked to shoot with any of my friends. It’s not just about shooting the trick, it’s more about having a good time skating and if things come out well maybe take a good photo home with me. Lately I have enjoyed very much shooting with Pol Catena and Yeray Escobar both of them are down for skateboarding and are willing to give their very best, I just enjoy to skate with them and to watch them skate. Plus things don’t just finish after the skate/photo session, it goes on all night and that’s just the perfect equation: Friends + Skate + Photography + Party = Best day! Yeray Escobar. Backside Boardslide. Premia, Spain. 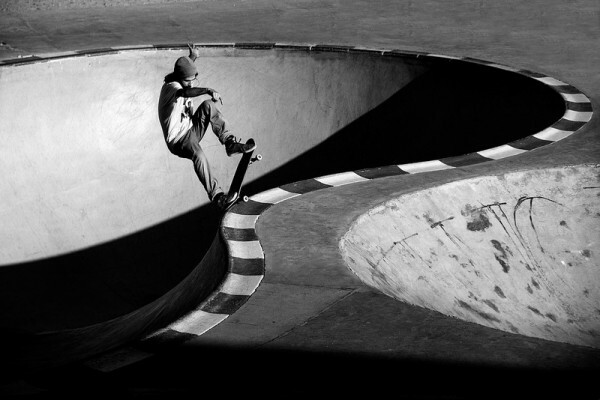 What’s your favorite skate photo you ever took? 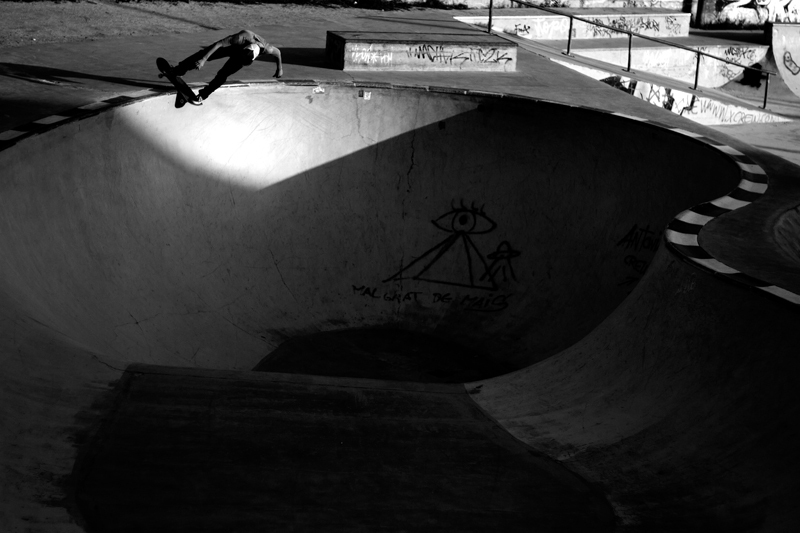 That would have to be the one of Emili LLeberia doing the Fs Nosegrind at the bowl in Premia, the combination of lines formed by the coping and the shadows, plus Emili’s style is so sick! You also like to shoot portraits? Lately I have started to shoot more portraits because usually I feel intimidated by people and don’t feel comfortable pointing the camera directly at them so the majority of portraits I’ve done are usually spontaneous, nothing much planned, and I would like to get more confidence. I’m practicing and trying new things, I love portraits and want to put more and more time into it, I have a lot to learn. Which skate (and non skate) photographers inspire you? The photographers that most inspire me are Greg Hunt, Ryan Allan, Marcel Veldman, Sem Rubio, Larry Clark, Magda Wosinska, Davy Van Larre, Switn, Bertrand Trichet, Brendan Klein, Eric Antoine, Patrick O’Dell, Morgan Massen… there are too many! Have you had your photos published in a magazine? Which/what/when? 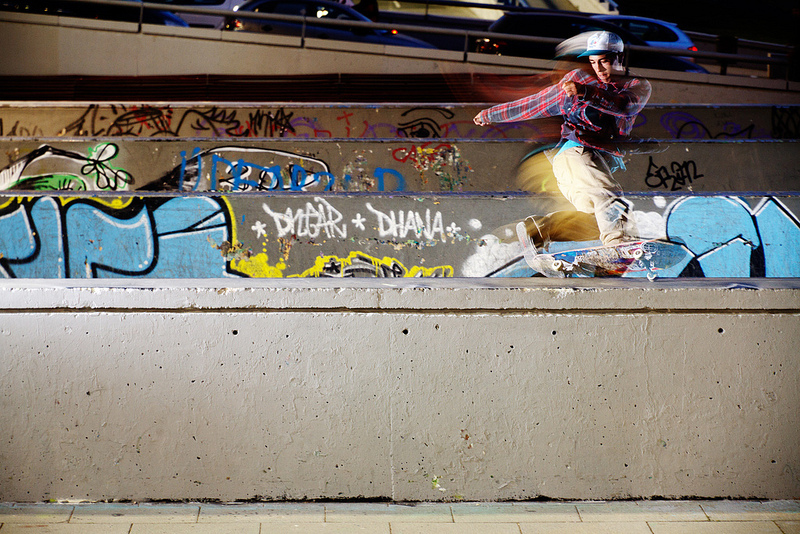 Yes, I had my first photo published this past December in Go Skateboarding Mag, a spanish skate mag. 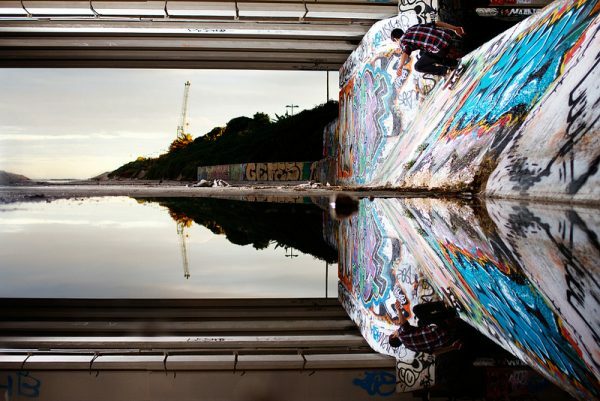 It was a photo of Yeray Escobar doing a bs tailslide up on a quarter spot in a tunnel for a checkout article. So stoked that my first published photo was of one of my best friends! And in march this year got a full interview published in the same mag this time it was with Pol Catena. Yeray Escobar. Hurricane at Guineueta, Spain. 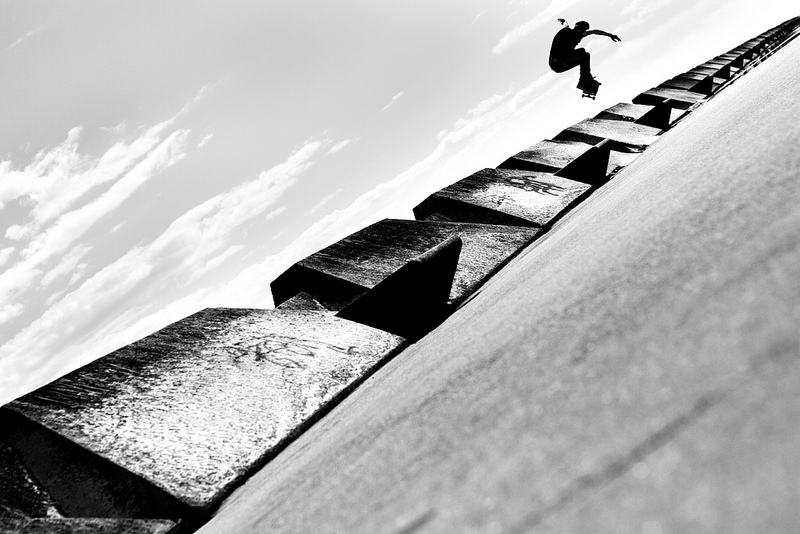 What’s your favorite place to travel for shooting skating? non skating? I was in Copenhagen last summer and it was epic, lots of street spots and bowls plus great people, I think it was a perfect place for shooting skateboarding, but I really think any place you go on trip with your friends where there are some good spots is just perfect. Non skating wise it would have to be far away from big cities either in the forests or by the ocean, I’d love to go to Wyoming or the Northern Coast of California, Ireland, Australia in the nature, in peace, away from big cities, touring in a van. 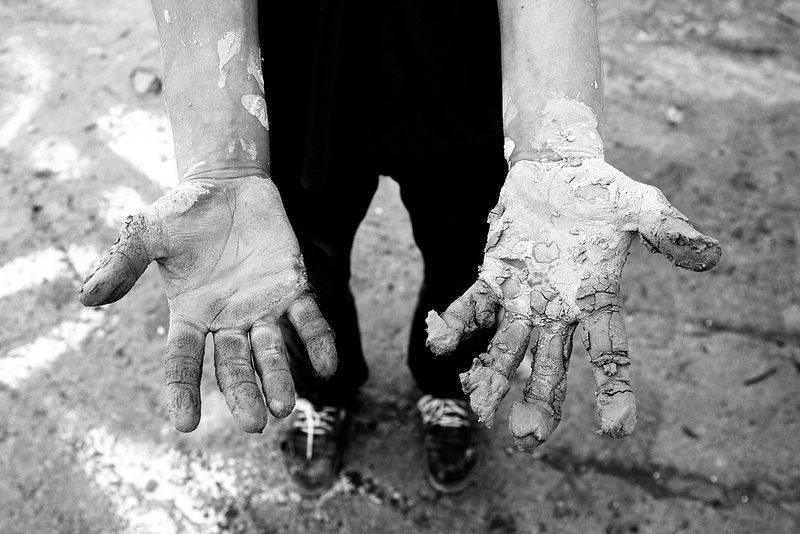 Did you go to Photography school or did you just learn by doing? At the moment, I’m studying. I’m on my last year of the Degree of Photography and Digital Media in Terrassa (Barcelona). I suppose I’ve learned stuff, but I’ve miss a lot of it I think. The degree is too much centered on technical photography and too much digital media such as CGI and not so much centered on going out to take photos which is what I’m more interested. So I would say I have got the theoretical knowledge from school but have had to learn and do all the other stuff by myself – practicing and just learning from the mistakes and with the help of the internet – I’ve always been inspired by the stuff I saw on the internet, magazines and books. Nahuel Ortega. 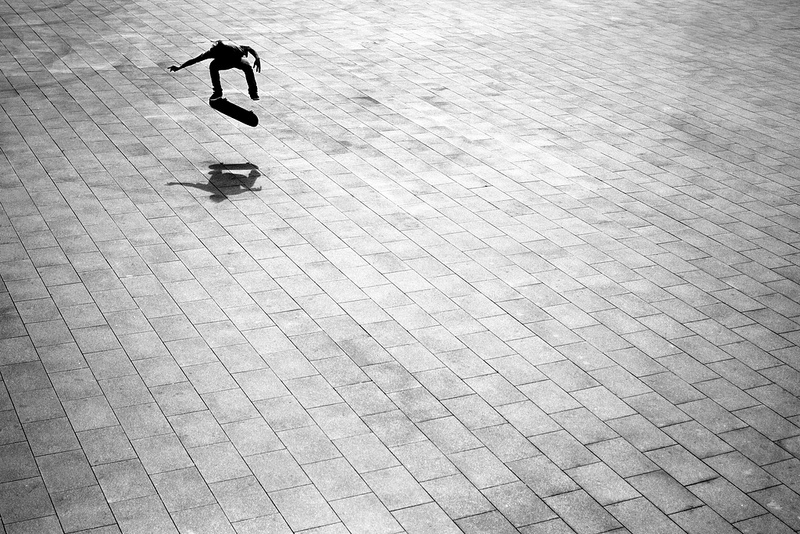 Front smith. Premia, Spain. What do you like better, digital or analog, and why? I mainly work with digital as it’s what I have and what I have been taught at school, haven’t done any film photography at school and suppose that has driven me to only use digital at the moment. I really like the feel and look of analog photography, the majority of my favorite photographers shoot on analog so I really want to get my fathers analog camera and give it a try and start from the basics. It’s one of the goals for this year. Juan Sorauren. Ollie. Tarragona, Spain. Do you have more serious plans with your photography in the future? Or do you just want to keep shooting photos of your friends? My dream would be to work at a skate mag, shoot skateboarding going on tour and that’s what I’m going to work on. But first of all I want to finish my studies and get that crap out of my way so I can dedicate all my time to be out on the streets shooting and get on with the projects I’ve had in mind, shooting the photos I like and doing my projects will hopefully take me to where I want to go. Any advice to aspiring skate photographers (there must be thousands of them these days) of how to stand out from the crowd? I myself am an aspiring skate photographer, haven’t achieved much yet to be giving great advice. First of all, enjoy photography and try to shoot things your way, do something new that hasn’t been seen, make it different from the rest we see every day and if it’s good it will end up standing out, I suppose. Toni Lopez. Frontside Smith. Badalona, Spain. Cels Ayza. Wallride. Vitoria, Basque country.